The reflection indicator creates a mirror image of the current market by reflecting recent price activity into the future with the purpose of identifying market trend and the potential trading range and volatility of the market going forward. The concept was popularized by Welles Wilder in his book on Adam Theory. 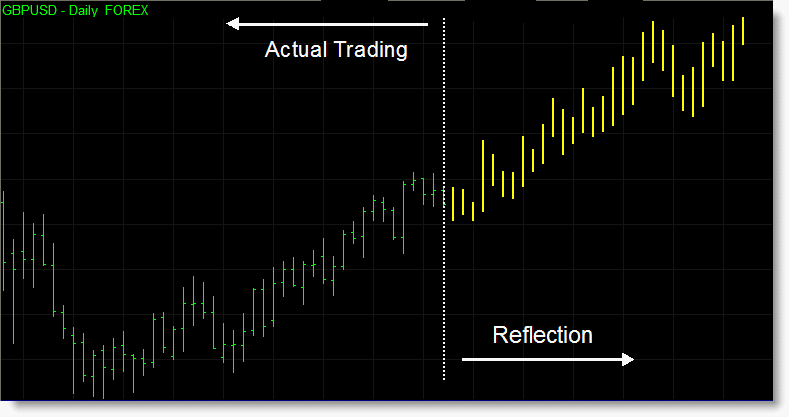 Reflection bars indicator - displays a mirror image of recent market price action on a bar by bar basis providing a visual projection of the current market into the future. This helps identify the volatility of the market and the worthiness of the trend along with potential profit targets over time. Reflection line indicator - is similar to the bar indicator but reflects a line, like a moving average, instead of actual bars. Reflection bands indicator - calculates the upper and lower extremes of the projected reflection and displays it as bands around the current price. The closer prices are to the lower bands the more bullish the market and the closer prices are to the upper band the more bearish the market is. Reflection oscillator indicator - is a sub-graph indicator which displays the current markets position in relation to the associated reflection bands. 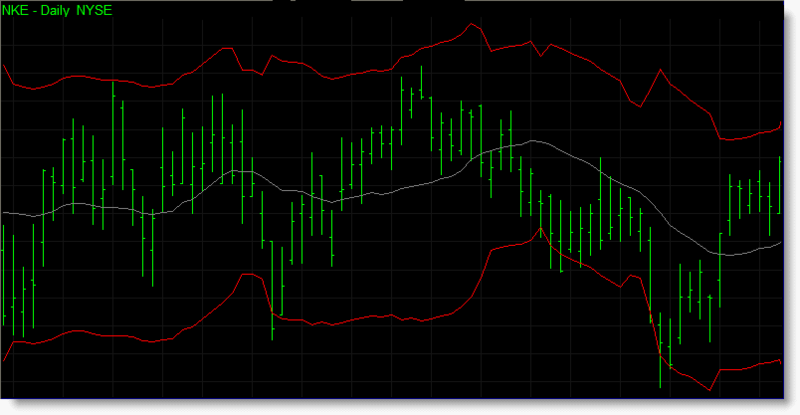 The higher the indicator the stronger the bullish trend and the lower the indicator the stronger the bearish trend. Reflection volatility bands - are similar in style to Bollinger bands and work based on the volatility of the reflection formula. 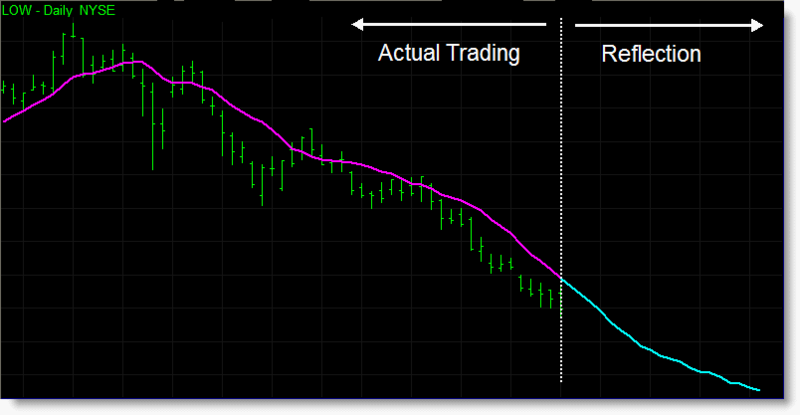 As prices near or cross the upper band the market is considered overbought and as prices cross the lower band the market is considered oversold. 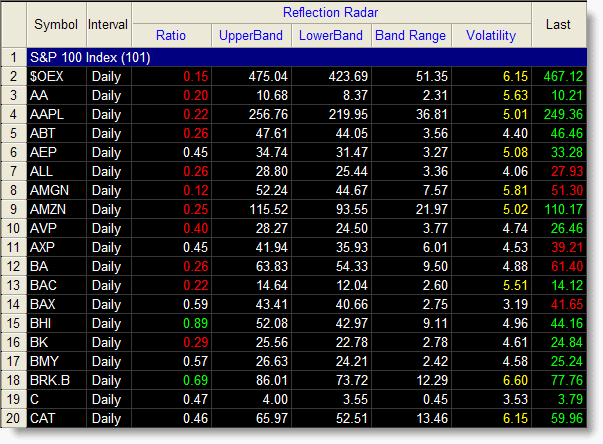 Click to view all reflection indicator screenshots. The reflection formula has been incorporated into multiple indicators to help you take full advantage of price reflections. Each indicator includes multiple settings for you to customize the indicator, including the ability to reflect more than just price bars. The reflection indicator set includes two dedicated RadarScreen indicators. The standard reflection RadarScreen indicator combines values from the different reflection indicators into one RadarScreen. Ratio – shows where price is contained within the reflection bands. The indicator is range bound from 0-1 with 0 meaning that the market is at the high of the trading range (the upper band) and 1 meaning the market is at the low of the trading range (the lower band). UpperBand – displays the upper reflection band value which is the highest price reflected over time. LowerBand – displays the lower reflection band value which is the lowest price reflected over time. Band Range – provides the range of the reflection bands from the upper band to the lower band. Volatility – displays the market volatility over the reflection period. 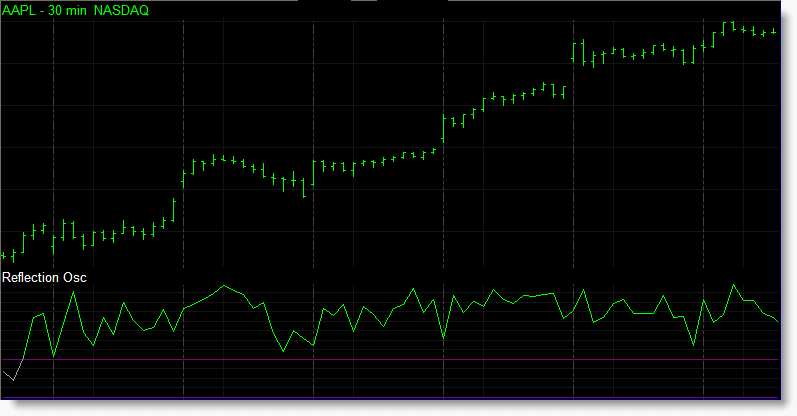 The reflection standard RadarScreen indicator applied to the S&P 100 stocks. The reflection indicator set also includes a second RadarScreen indicator for the reflection volatility bands. Ratio – shows where price is in relation to the reflection volatility bands. A value of 0 meaning that the market is at the high of the trading range (the upper band) and 1 meaning the market is at the low of the trading range (the lower band).A ratio value less than 0 means price is currently above the upper band and a ratio value greater than 1 means price is currently below the lower band. UpperBand – displays the value of the upper reflection volatility band. 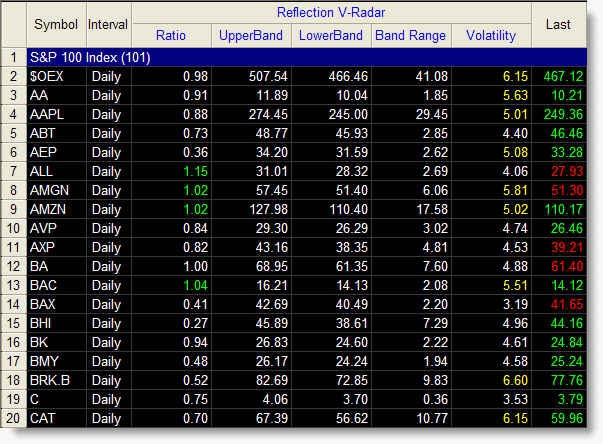 LowerBand – displays the value of the lower reflection volatility band. Band Range – provides the range of the reflection volatility bands from the upper band to the lower band. 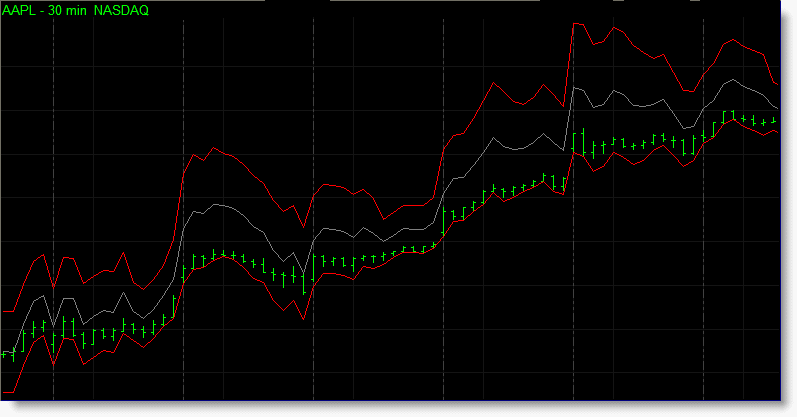 The reflection volatility bands RadarScreen indicator applied to the S&P 100 stocks. Click the button below to add the Reflection Indicator Set for TradeStation to your wish list.